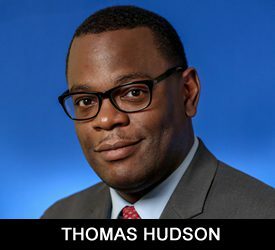 Thomas Hudson currently serves as the Special Assistant to the President and Chief Diversity at Jackson State University. As the Special Assistant, Mr. Hudson is responsible for providing strategic leadership and support for the President’s initiatives and priorities. He works closely with other senior administrators in promoting the administration of university programming, policies, and procedures. He also acts as an adviser to the President on matters related to the direction of the university; anticipates problems, critical issues, those of immediate and long-range concern as they arise as well as opportunities, and advises the President accordingly. Mr. Hudson provides direct oversight for the departments of Human Resources and General Counsel. As Chief Diversity Officer, Mr. Hudson offers strategic and practical guidance on policies and practices related to the diversity and inclusion of faculty, staff, and students. He is responsible for the implementation of the university’s comprehensive diversity plan; assists in the development and implementation of alternate admission policies in an effort to increase the enrollment of underrepresented student groups. He engages the use of outside consultants to help develop interventions necessary to foster a climate of diversity and inclusion within university divisions. Mr. Hudson previously served as Chief Operating Officer and Equal Employment Opportunity Officer/Title IX Coordinator for Jackson State University. Prior to Jackson State, he operated the Hudson Law Firm in Jackson, Mississippi and served as Equal Employment Opportunity Officer for the Department of Homeland Security. Mr. Hudson received his bachelor’s degree in political science from Jackson State University and his juris doctor degree from the University of Mississippi School of Law. He is a member of the Mississippi Bar Association and attends New Jerusalem Church in Jackson, MS. He is married to Phylandria Hudson and they are the proud parents of two daughters.